HEPI’s report The Invisible Problem? Improving Students Mental Health, by Poppy Brown, highlighted that despite students having access to strong social networks and better employment prospects, survey data repeatedly shows that student are on average less happy and more anxious than the general population, including other young people. As such we welcome this Guest Blog from Student Minds concerning their development of a University Mental Health Charter. In his recent speech, Universities Minister Chris Skidmore identified Student Minds’ University Mental Health Charter as the first of “three pillars” of a new deal for university mental health. The aim of the Student Minds University Mental Health Charter is to encourage and recognise excellence in the way HE providers promote the mental wellbeing of their whole community. Through the Charter, we hope to inspire cultural change and have a long-term, transformative effect on the mental health of both staff and students. 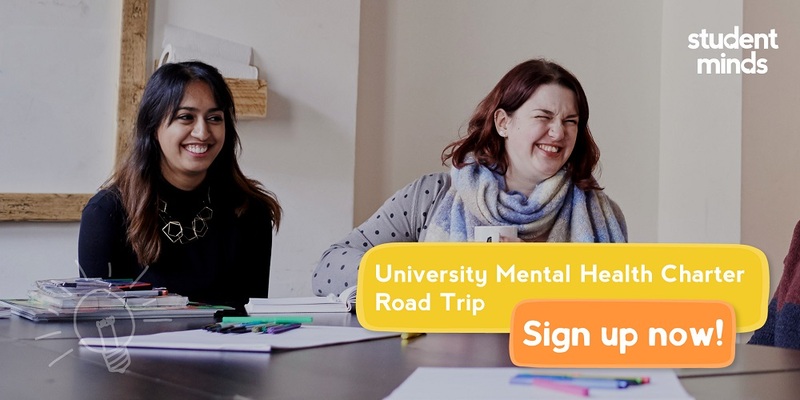 This week, we take the next step in that process and are excited to announce the Student Minds – University Mental Health Charter Road Trip. The Road Trip will be the largest-scale university mental health project to date, offering all members of the university the opportunity to shape our vision for a better future. There will be six consultation events around the UK, bringing together university leaders, staff and students to help shape the Charter’s structure and content. This will be supplemented by a series of online surveys for staff and students, to ensure that as many people as possible can get involved and make their voice heard. At each Road Trip event there will be a series of focus groups facilitated by experienced researchers. Together, we will explore a range of themes that impact on student and staff mental health; from student transitions, prevention and strategy to built environment, families and staff wellbeing. Alongside focus groups, there will be a variety of opportunities to provide thoughts and feedback, an informative keynote and interactive workshops around student and staff mental wellbeing. We will work closely with students to design the day and deliver sessions. We hope the events will offer participants valuable opportunities for discussion and shared understanding, providing insights that both students and staff can take back to their universities. Mental health affects everyone. We also believe that real cultural change requires a whole university approach to mental wellbeing which stretches beyond student services. That’s why we’re inviting everyone to take part in the Road Trip, not just those who work in student support. In particular, we are keen to see participants who are students, academics, student wellbeing staff, other professional services staff and senior leaders. We would ask universities to ensure that they encourage staff from a range of roles to consider attending one of the events. How else are we consulting and gathering evidence? To further strengthen and diversify our evidence base, we will be opening a series of online surveys, aimed at students and specific groups of staff, at the beginning of March. We will also be working with NUS to hold a series of targeted, co-creation panels with diverse groups of students, to ensure that we are hearing from a broad range of voices. The development of the Charter is also closely aligned to other key pieces of work taking place within the sector. In particular, the evidence and feedback we gather here will be considered alongside the work of colleagues in UUK, on the #Stepchange refresh, researchers within the SMaRteN network and in What Works Wellbeing. We will seek to publish our findings so they are available to the whole sector and enhance our collective understanding of student and staff mental wellbeing. From the whole Student Minds Team, we look forward to seeing you in March! I am really interested in attending the Leeds based event and wondered if there is a booking form please, or is it a case of just turn up?